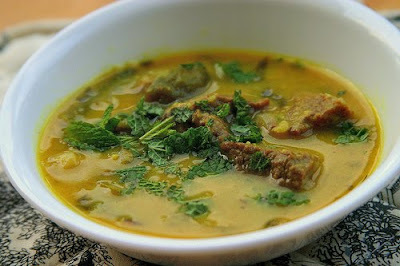 Discription:A delicious mutton dish from the Bohri Muslims of Gujarat.Try it and Enjoy!! Pressure Cook the dal in 2 1/2 cups of water for 10 minutes. Fry the onions till golden. Add the ginger- garlic paste, chilli powder, turmeric and coriander powder and fry well. Add the meat and fry till the oil separates. Beat the curd and the salt and green chillies. Add to the meat fry, stirring for 3-4 minutes and add the gram dal puree. Tie the curry leaves in a bundle and add to the meat along with 2 cups of water. Let boil on medium flame, covered, for 10-15 minutes or till the meat is done. Heat the ghee in a small frying pan. Season with whole dry chillies and garlic. Fry till the garlic browns. Add to the meat, simmer 5 minutes. Remove the curry leaves and serve hot. 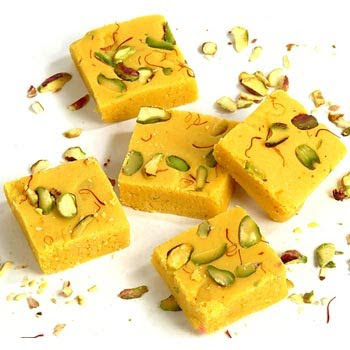 Discription:This is very tasty recipes.Try it and Enjoy!! Heat oil, add cumin and mustard seeds, asafoetida, allow to splutter. Add green chillies, stir, add papaya. Add all other ingredients, mix well, remove from fire. Mix all ingredients, by adding water little by little to make a very soft dough. Take a small ball of dough, place on a greased polythene sheet. With base of palm drag the dough in a straight line, from start. For support hold the dough at starting point with other hand. This will for a strip of the ball of dough. A little practice will make this technique very easy. Heat oil in a wide heavy pan. Make 3-4 such strips, put in hot oil. Fry both sides on medium heat, till crisp but not browned. Drain and cool to crisp further. 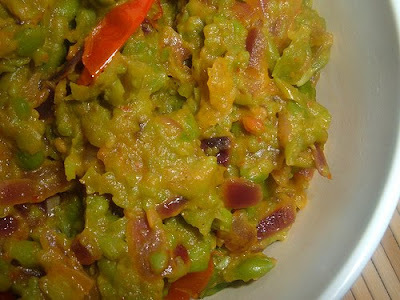 Serve with papaya chutney or green chutney. 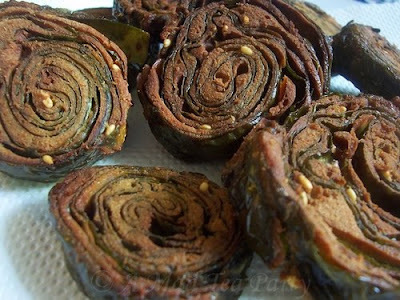 Discription:A spicy Gujarati 'farsan' or crunchy fried snack.Try it and Enjoy!! Cook the mung dal to a paste like consistency. In a big bowl add rice flour, mung dal paste, turmeric, salt, chili powder, carom seeds or cumin seeds. Heat 2tsp oil and add the sizzling hot oil to the rice flour mix. Add water as needed to make a stiff dough. Take a lemon size dough and place it in a chakli mould or mould with star nozzle. Test the oil by dropping a small piece of dough and wait for 3 seconds if it does not rise to the top then oil needs to be heated more. 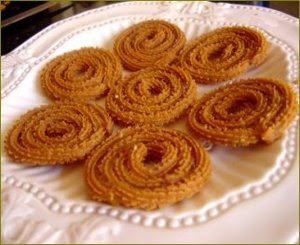 Gently make a spiral with the chakli mould and deep fry to a golden brown. Clean the beans and cut them into 1"long pieces. Blanch (or use frozen beans), drain, cool, set aside. When they begin to pop, add garlic and stir till light brown. Add crushed red chilly and stir for a few seconds. Add green beans, sugar and salt. Simmer the flame, stir and cook for about 8-10 minutes or till they taste spicy. Sprinkle pepper powder, mix well and serve. 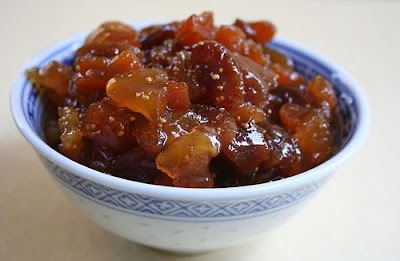 Discription :This is very tasty recipes.Try it and Enjoy!! Clean, wash and wipe leaves. Roll lightly with a rolling pin. Mix all ingredients except those for seasoning to a thick paste. Take a leaf and place it backside up on a flat surface. Take a little paste and apply thinly all over leaf surface. Place another leaf over it. Repeat the process on a set of 3-4 layered leaves, top layer being that of paste. Fold in the edges and roll the leaves, starting with their base towards tip. Make the roll tight and seal sides with some paste. Make more sets of 3-4 layered leaves until the paste is finished. Steam the rolls in a double boiler or steam cooker for 30-40 minutes. Cool and remove. Cut into 1/2" thick slices. 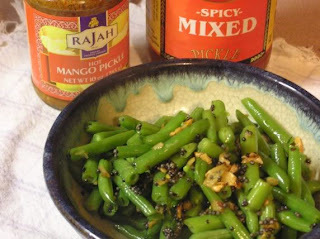 Heat oil, add cumin and mustard seeds, allow to splutter. Add sesame, coriander, and coconut. Add salt, chilli and sugar if needed. Mix well, serve hot or cold. Grind roasted onions, peanuts, coconut, ginger, garlic and sesame seeds to a fine paste. Heat oil and deep fry green chillies, remove and keep aside. Fry the ground paste in the same oil by stirring continuously. Pour little water at regular intervals while frying the paste. Stir well by adding yogurt, lemon juice and salt. Add tamarind pulp and stir well until the gravy is of sauce consistency. Bring to a boil and remove from fire. Garnish with chopped coriander leaves and serve hot with biryani. 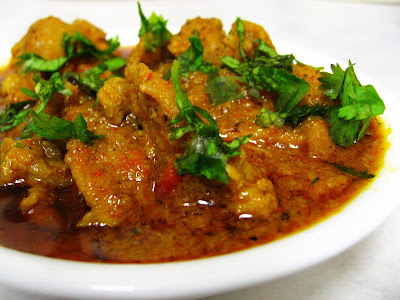 Discription:Chicken gravy as the name indicates is a creamy & spicy curry base in which the chicken is simmered.The aromatic spices adds a wonderful flavour to the chicken.This curry goes very well with ghee rice, rotis, chapathis etc. Beat curds / yoghurt until smooth & well blended. Add turmeric powder, 1 Tsp Of Chilli Powder and 1 Tsp ginger garlic paste to the yoghurt & mix well. Add well washed & cubed chicken pieces to the yoghurt mixture & mix well. Marinate for an hour in the refrigerator. The more time marinated the better. Heat 3-4 tsps of oil in a pan & add 2 sliced onions. Fry them until golden. Cool & grind the onions along with 1 cardamom to fine paste along with little water. Heat Oil in a pan, add the cinnamon, cloves & cardamon to the oil when hot. After a minute, add 1 sliced onion & green chilles. Saute untill translucent. Add ginger garlic paste & fry for 1-2 minutes. Now add just the chicken without the yoghurt marinade. Fry the chicken well for 6-8 minutes on high heat. Add the chilli/dhania/cumin powders & fry for few more minutes. Add the marinade now along with a cup of water & salt. Adjust the spices if needed. Add the onion paste & mix well. Simmer for a few more minutes, until done. Garnish with cilantro if needed. Dissolve corn flour in little water. Boil the milk and add the diluted corn flour. Cook until it becomes thick. Mix sugar and remove the milk from the flame and let it cool. Now add vanilla essence and colours to it. Beat the mixture and add cream. 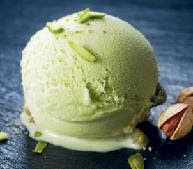 Keep the icecream in refrigerator for about an hour. Remove and beat it again. Add crushed pista. Again keep it for cooling. Put the tomatoes in a pan. Pour sufficient water and boil. Add mint and salt to the boiling mixture. Boil for about 10 minutes. Cool and blend the tomatoes with the help of a mixer. Sieve the blended mixture to remove the seeds and skin. Tomato soup is ready to serve. Discription:This is very tasty recipes.Try it Enjoy!! Place aata, salt, carom seeds, 2 tsp ghee, besan, turmeric powder, finely chopped methi, salt, red chili powder or finely chopped green chilies and water in a bowl and knead it well to get soft dough. Apply some flour on both sides and roll it in to paratha. You can give any desired shape to parathas. Apply ghee and fry it until light brown. Serve hot with green chutney or plain curd. Mix all the ingredients and knead into a soft dough, adding a little water if required. Roll out each portion thinly into a 125 mm. (5") diameter circle. Cook each paratha on both sides on a non-stick pan, smearing a little oil on each side, until brown spots appear on the surface. 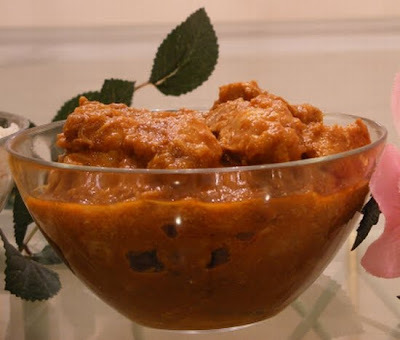 Discription:This recipe is from Sanjeev Kapoor’s Khazana of Indian Recipes. This goes well with roti, plain rice and pulav. Cut mushroom into bite size pieces. Heat oil in a pan & add cardamom, cinnamon & onion. Stir it till the onion turns golden brown colour. Add ginger garlic paste and stir for a few minutes. Add tomato paste along with spice powders and cook till the oil starts appearing. 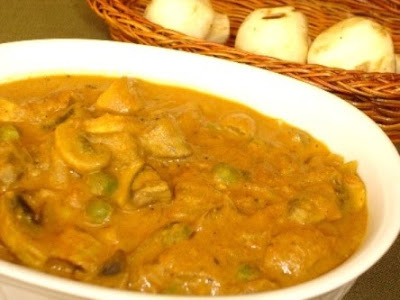 Mix the cashew nut paste with one cup water and add to the curry. When it starts boiling add sliced mushroom & peas. Cook till the vegetables are done. Note: for cashew nut paste, soak 10-15 cashew nuts in warm water for 1o minutes and grind it with a little water. The gravy tends to be thick after sometime, so adjust the quantity of gravy accordingly. 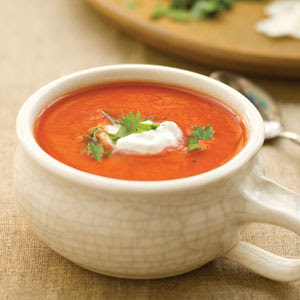 Discription:This is very tasty soup.try it and Enjoy!! 2 cups of assorted frozen veggies. Cook noodles as per directions. Make a paste of shallots,lemongrass,sambal oelek and ginger. Add to it coriander,curry powder,turmeric,paprika and cayenne pepper and make a smooth paste. In a large pot...medium heat..add the oil..then add the shallot mixture from above and cook it for about 3 minutes, stirring well...adding a little stock to it..to make sure it does not burn. Then add the frozen veggies (if using)....stir it well...and add the rest of the stock. Reduce the heat...add the sugar,salt and pepper. Simmer for 20 minutes...then add the coconut milk and heat it through without letting it boil. Add the noodles and the tofu ( toaste the tofu in a pan lightly- can omit this step) and simmer for 5-7 minutes. To serve...add the cucumber, scallions (if using) in a bowl. 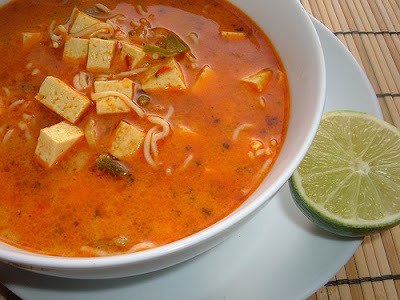 Pour the laksa over it and garnish with cilantro..pineapple (if using). Plop a lime wedge or half on the side too!! Discription:If you are waiting for somthing new.Then try this and Enjoy!! Red chilly - 1 tsp. Boil the peas with a little salt and keep aside to cool. Drain the water....and if you are obsessed on healthy eating...you can reserve the water for soup or something...if you are normal ;)(kidding!! )...do this in the sink. Heat oil in a wok..
add the cumin..onions..garlic...green chillies...tomatoes and fry in medium heat for 15 minutes..
till everything is cooked and mushy. Add the salt (remem you added some to the peas when you were boiling it)..peas..red-chilly and cook for 5 minutes. It was really yummy...would be great as a spread on bread. Discription:This is very tasty recipes. Try it and Enjoy!! Red chilly powder - 1 tsp. In a pan, add 1 tbls of oil, then add the jeera, onions and garlic and cook till softened. Drain the chickpeas and wash well and keep aside. Add the sauteed onion-garlic mixture to the above drained chickpeas and pulse in ur food processor or blender till it is all well combined. Do not add too much of water, 1 or 2 tbls will help if you are using a blender. I have Kitchen Aid and i was able to make it to a rough paste - used the pulse function. Now put the above in a bowl, then add salt, red chilly powder, chana masala and cilantro and combine well. Now refrigerate the above mixture for 3-4 hours, to let the flavors combine well. Take the mixture out of the refrigertor about half an hour before. Heat the oil, but make sure the oil does not smoke. 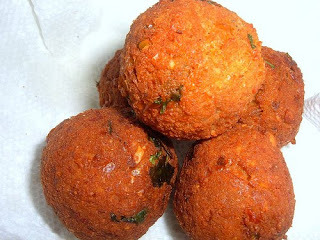 Make small falafel balls, and deep fry this in medium flame. Note: Do make the falafel balls small, resist to make them big, trust me the small ones fry evenly and taste better. Also, fry them in medium flame, this ensures the inside gets cooked well.